There are three factors at work in your hot tub: heat, buoyancy and massage. Together, they create natural healing powers and health benefits discovered by the ancient Greeks years ago. The Romans, Greeks, Japanese and other cultures have recognized the many benefits of this relaxing and rejuvenating experience to mind and body. From simply unwinding to soothing sore muscles and joints caused by sports or minor strains, a hot tub soak can make you feel better – naturally. Stress has an adverse effect on health – the heart works harder, breathing becomes more rapid and shallow, and digestion slows. Nearly every process of the body is degraded. Researchers have estimated that nearly 80% of disease is stress-related. Relaxing in a spa stimulates the release of endorphins, the body’s natural “feel good” chemical, giving you a sense of well-being and rejuvenation. Warm water and soothing massage relieve anxiety and relax tense muscles. A spa provides a sanctuary for quiet moments alone or to reconnect with family and friends. Eases muscle pain, fatigue, stiffness and soreness due to sports activity or exercising. Stimulates release of endorphins, the body’s natural pain killer. aises body temperature and causes blood vessels to dilate, resulting in increased circulation and blood flow, accelerating the body’s natural healing process. Speeds elimination of lactic acids and other toxins, which are replaced by oxygen. Relaxes muscles and stimulates the release of endorphins, the body’s natural pain-killers. Reduces body weight by approximately 90%, relieving pressure on joints and muscles and making it a safe and gentle environment for warm water exercise. Check out these Arthritis survey results! How Do You Obtain Arthritis Relief? Keep in mind, if a doctor prescribes soaking in a hot tub for pain relief, its purchase may be partially tax-deductible as a medical expense. Consult IRS (1-800-TAX-FORM) or visit www.irs.gov and ask for Publication 502 for additional information about the tax deductibility of medical expenses. 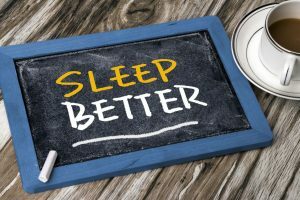 According to a study in the scientific journal, Sleep, a drop in body temperature can help ease your body into a deeper, more relaxing sleep. Relaxing in hot water for 10 minutes approximately 90 minutes before bedtime causes the body’s internal thermostat to pull your temperature down, enabling you to drift into a deeper, more relaxing sleep. Hydromassage is a natural remedy, unlike prescription and over-the-counter drugs and alcohol, all of which make you feel groggy and have other adverse side effects. The beauty of a spa-induced sleep is that it is a natural remedy without the adverse side affects some sleep aids may come with. Ideal for individuals who are physically unable to exercise. (Immersion in a spa simulates the beneficial effects of exercise). As unbelievable as it may sound, recent studies have proven that the regular use of hot tubs can aid in the reduction of weight, as well as diminish the appearance of cellulite. This stems from the fact that soaking in a hot tub simulates exercise. The hydrotherapy dilates the blood vessels, promoting better circulation as it relaxes the skin and muscles. It also raises the heart rate, while lowering blood pressure. This seems to indicate that soaking in a hot tub may be healthier for your heart than the traditional methods of exercise. An article that appeared in the September 16, 1999 issue of the New England Journal of Medicine followed a group of subjects who were required to soak in a hot tub for thirty minutes a day, six days a week, for three weeks. Though this study was for diabetes research, the results were wide-reaching. The patients’ weight was reduced by an average of 3.75 pounds! The subjects lost over one pound per week, just by soaking in a spa. Regular use of hot tubs can also help to diminish the appearance of cellulite. The fatty deposits that typically gather on the hips, thighs and buttocks of most women past their 30s can never be fully eliminated. The design of a woman’s body naturally causes the skin to dimple out, whether she is overweight or thin. However, by improving circulation to the areas affected by cellulite, it has been proven that the appearance of the unsightly deposits can be reduced. 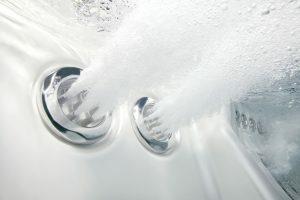 According to a variety of medical sources available on the Internet, the hydrotherapy that a hot tub provides stimulates the blood vessels, increasing circulation. It also tones the body tissue, reduces fluid retention and relieves swelling. All of these benefits combined can result in the diminishment of the appearance of cellulite. © 2006 Watkins Manufacturing Corporation 1280 Park Center Drive, Vista, CA 92081 Neither Watkins Manufacturing Corporation nor Teddy Bear Pools & Spas shall be liable for any errors in the content, or for any actions taken in reliance thereon. Always consult with your physician before using a spa.